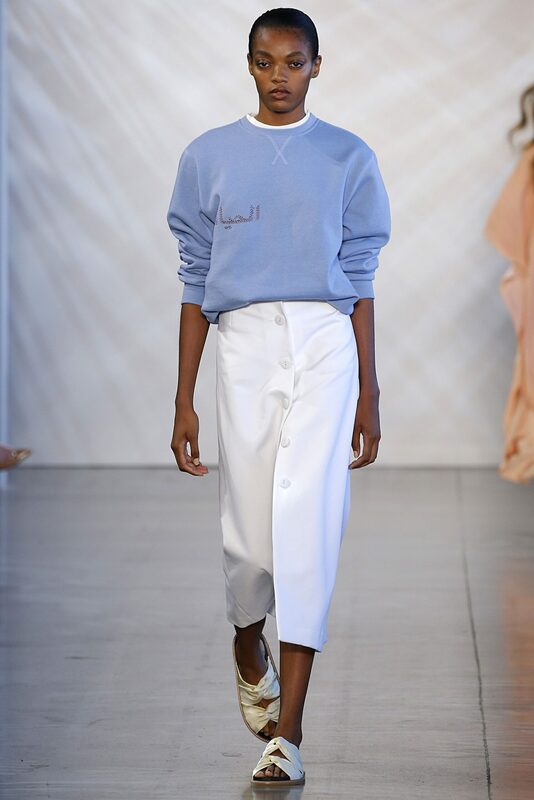 Bahrain has become yet again the inspiration for the Noon By Noor Spring/Summer 2019 RTW collection, designed by Noor Rashid Al Khalifa & Haya Mohamed Al Khalifa. The palette of dusty tones: Sand, Pink Sand and Blue Haze derived from the landscape of dunes, sea and sky. These shades work back to a core of clean Optic White and Black. Colors work as tone on tone in the textural ‘Palm’ print as well as the second print, a delicate hand drawn stripe, offered in a combination of two opposing colorways. 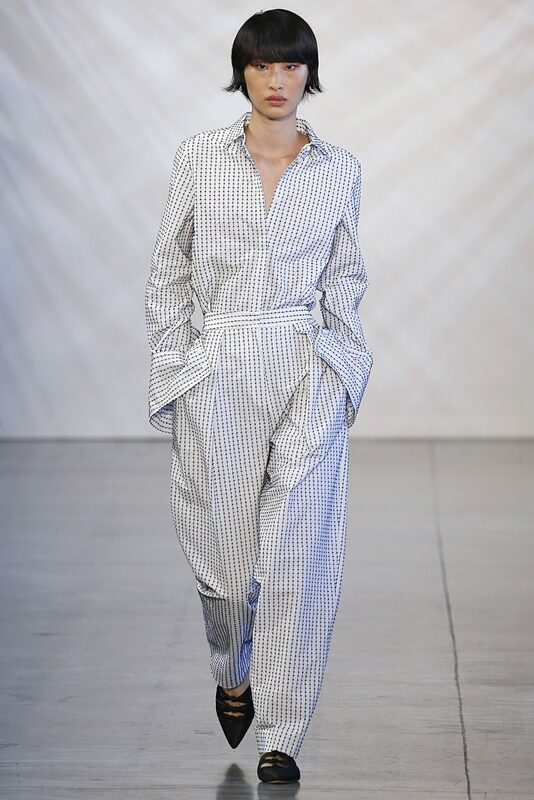 Silhouettes are influenced by traditional Middle Eastern costume, which also inspires the manipulation of printed lines around the body. Easier pieces are cut with movement and have planes of striped cloth, tucked and folded to offer distorted optical patterns. Fabrications give depth to the collection through natural fiber qualities, and texture is created with surfaces broken with stripe weaves, mini pleats, accent Dobby weaves and undulating fringes. The palm leaf is taken as a symbolic motif from the island and is interpreted in the use of sunray pleating in tops, skirts and dresses, all contributing to a flow in movement. Embellishments also echo the leaf frond and are worked as a literal motif in tone on tone thread-work, or traditional ‘Pitta’ work, in Metallic Bronze. 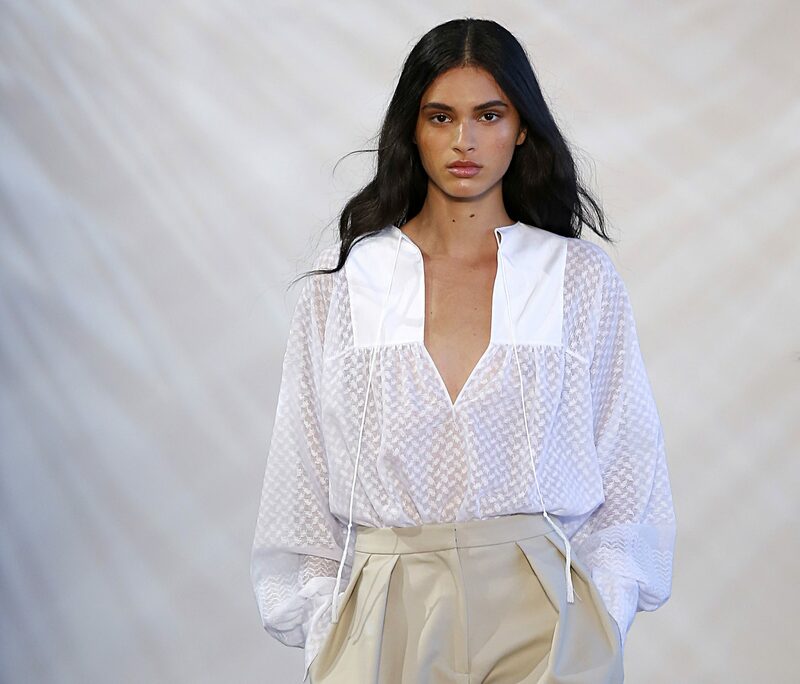 Styling pays tribute to the masculine and feminine, by contrasting clean mannish tailoring and separates worn back to drape, offering fullness and movement.